This my third post this week on the Jamestown settlement. I’m not quite done with it. Next week, I’ll finish this portion of American history with some commentary on why Jamestown is significant. 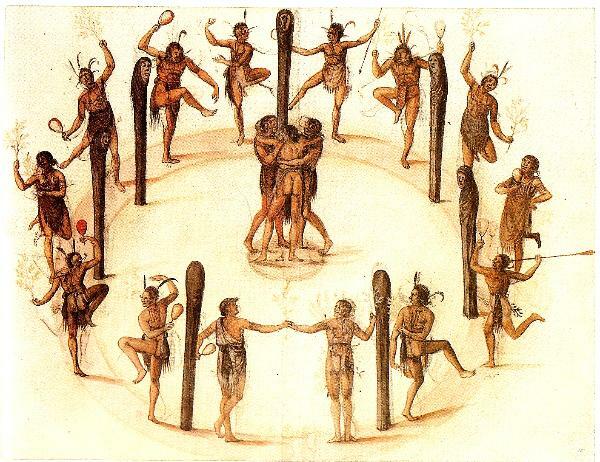 Today, I want to shed some light on the natives who crossed paths with those early settlers. What type of society did these Englishmen find when they arrived? First, let’s dispense with unrealistic romanticism. All humans are sinful. They have a propensity to treat others badly. This certainly was evident in the New World. The rosy picture of natives living in perfect harmony with nature and then having all that disturbed by Europeans is not very accurate. When the Spanish saw how the Aztecs carried out human sacrifices, they were horrified. That’s not meant to absolve the Spanish from their share of the blame for how things turned out, but we need to have a balanced picture of the past. The natives in the Jamestown area were part of a broader grouping called the Algonquin. The Powhatan Confederacy that the English came upon was one portion of that larger grouping. They had no written language, so we have no primary documents from them personally. What we have is the English explanation of what they saw and experienced. A one-sided view can be skewed, to be sure, but further research and archaeology have substantiated much of what they told us. The Algonquin worldview was dark. Only the chiefs and priests had any hope of a kind of life after death; they supposedly were reincarnated. The common people had this life only—no hope of an eternity in the presence of a loving God. The culture was polytheistic, featuring many gods for many different purposes. The one they dreaded the most was Okeus, who had to be appeased continually. Throughout the Algonquin tribes, child sacrifice for that purpose was practiced. Warfare was a staple of life. Tribes had shifting alliances over time, all for the sake of self-preservation. The natives did not view themselves as one big happy family suddenly interrupted by the English. Their perception of these new settlers was that of just another tribe in the region to be dealt with. If you were caught in a war by the enemy, you could expect to be tortured in the most cruel ways. They had developed a rather sophisticated method of skinning people alive and cutting off body parts while the victim was still conscious, and even eating those parts while he watched. If you were a young boy entering manhood, the practice was to give you a powerful drug to erase the memory of boyhood. This was how you transitioned into becoming a man. Chief Powhatan (a title, not his actual name) was already advanced in age when the Jamestown people first encountered him, but he was still vital and strong. He had to be. His confederacy was held together by force and intimidation. Powhatan ruled over thirty conquered tribes: note the word “conquered” here; they didn’t apply for membership. Once in the confederacy, they owed him a tribute of 80% of their crops—in other words, he had an 80% tax rate. So how did they survive? 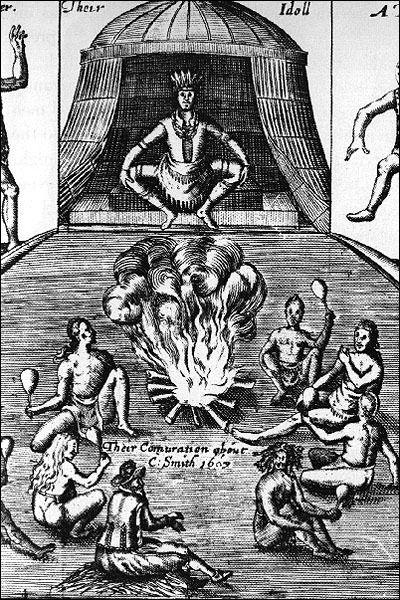 It appears that Powhatan mastered the age-old system of redistribution of wealth. As long as you were trustworthy and obedient, he would, from his bounty, send some of it back to you. Sound familiar? Sound rather contemporary? 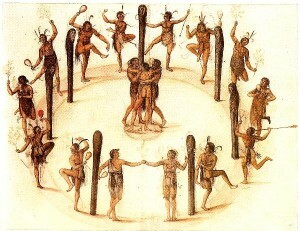 Powhatan also had approximately one hundred wives, taken from the various tribes under his authority. He would then have one child with each, solidifying the connection with each tribe. One can say without too much exaggeration that he was the “father of his country.” Summary: Powhatan was an absolute despot who ruled with an iron hand. When the Starving Time hit Jamestown in 1609-1610, Powhatan did all he could to withhold any aid, hoping they would all die out. 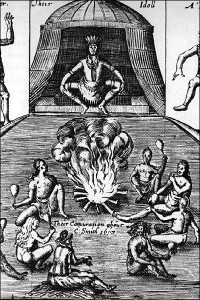 Later, when his daughter Pocahontas married a settler, relations between the cultures relaxed for a time, only to destroyed by the massacre of 1622 that I described in an earlier post. From the Christian point of view, what I see is a culture devoid of the light of the Gospel. It was a culture desperately in need of hope, that lacked the understanding that the Son of God—the only God—had reached out to His creation through His own sacrifice, which would take the place of human sacrifice. Pocahontas and Chanco, among others, gained that understanding and realized that hope. Most rejected it. In a previous post, I highlighted some of the true Christians who sought to minister to the natives. If there had been more of those type of men, this part of our history would have been more praiseworthy.